Patrick Leagas has had quite a convoluted back story. An ex-member of the original formation of Death In June, he formed 6 Comm, after leaving the Death In June ranks, and made some great records in a dark rock vein. In the early 1990s he took a backseat in the Pagan Dance outfit Mother Destruction where he provided the tribal rhythms and music to Amodali's exploration and celebration of sensual female centered magick. Over the years 6 Comm have made the occasional return where Leagas has revisited his past, most recently on One Mans Hel, which documented the recorded live set 6 Comm had been performing at selected live performances. In between there have been sporadic re-recordings on compilations such as Like Stukas Fell and Ontogeny that paid homage to his past. On other releases like Headless / Let The Moon Speak 6 Comm took a fresh and more idiosyncratic approach to composition - gaining comparisons with Scott Walker's recent material. Schräge Musick, one of his current projects was formed to focus specifically on 20th Century conflict. Along the way there was the reviving of The Fruits Of Yggdrasil his one-off musical collaboration with runic high priestess Freya Aswynn and a special one-off performance with Death In June to celebrate the 20th anniversary of NADA! 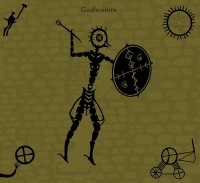 Godlesstate represents his latest musical project and it opts for a more rhythmic approach, expanding on the percussive, tribal rhythm of Mother Destruction, taking them into Middle Eastern realms similar to areas that Headless / Let The Moon Speak traversed. Amidst the rhythms are electronics, noise elements, and brooding soundscapes with all sorts of pipe instruments. You won't find any lead vocal performances here; his vocals are now castigated to the edges, mostly acting as accompaniment and embellishment - which is a shame as we know he has a commanding vocal presence. Instead we have melodies performed on flutes and countless reed instruments. There's a distinct ethnic and Arabic feel to much of Godlesstate, as well as frosted soundscapes. "Am I dreaming? Is this reality?" question the slowed down treated vocals that open 'Godless State' as thunderous drums enter and continue to pound over electronic buzz. Right from the opening beat it's clear that Godlesstate travel to a different beat to that of 6 Comm. With layers of cascading drums and growled vocal tones it unleashes a furious tirade of howls and harsh textures. "Is this godless state? Is this duality? ", Leagas asks over the turbulent maelstrom of rhythms, frequencies and electronics. The powerful delivery continues on 'Birch Initiation' where amidst discordant buzz and harsh whipping electronics, Leagas's voice is deployed as a ritualised roar. An undercurrent of rhythmic noise is bolstered by muscular hand drum pounding with other percussive devices ensuring a relentless delivery of rhythmic ritualised noise. Perhaps his work with Gaya Donadio's noise outfit ACL has slipped into his consciousness here but 'Birch Initiation' also shares a kinship with KnifeLadder, the rhythm 'n' noise outfit featuring the exquisite percussive prowess of the late John Murphy, something we'll return to later. Leagas has a powerful and commanding vocal but on this eponymous album they are pushed to the periphery and almost treated as another sound layer. On 'Seed Time Slipping' the multi-layered vocals are whispered, treated and harmonic set amidst the rolling rhythms and miasma of wails, whistles and percussive treatments. The lolling rhythms here lay the basis for the pipes and flutes that will become integral to much of the first half of Godlesstate. Leagas's proficiency as a percussionist really comes to the fore on the next three tracks. With a masterful interplay of hand drums 'Vedic Transference' channels a Middle Eastern spirit, conjuring visions of dervishes and Sufi's that Leagas has encountered on his travels. The amalgamation of drums, shakers and bells point towards an obvious comparison with Muslimgauze, the musical project of the late Bryn Jones. Leagas' work here is more intricate and dynamic, accompanying the rhythms through quickening passages with wordless embellishment and light electronics, which feature more prominently in later tracks. 'Vedic Transference' only hints at the percussive dexterity to come when compared to 'Cedar Forest' and 'Enkidu's Wildness', the longer tracks that follow, inspired by Leagas's reading of the Epic of Gilgamesh, the oldest written story in the world. Leagas's work with Freya Aswynn amply illustrated his ability to create sympathetic background soundscapes and it's something found on Godlesstate too. Far more atmospheric than the preceding tracks, the drone infused Arabian sounds of 'Cedar Forest' are swollen with percussion and shakers as reed instruments billow with a breathing like manner. Leagas's voice appears, occasionally spoken and more often as harmonic accompaniment, as it takes on an evocative brooding ritual nature of hand drums, bells, pipes and ominous electronics. 'Cedar Forest' pushes the rhythms that propelled the 6 Comm album Headless / Let The Moon Speak into the arena of world music. This and the later 'Catalhayak & Beyond' are the tracks that should be played to those who after more than a 30 year absence still view Leagas through the prism of Death In June. From a soft hammering pulse, 'Enkidu's Wildness' bursts into hand drums accompanying treated guttural tones, reedy pipes, shakers, shanai wails and ringing electronics shudders. Like a cut down version of the Moroccan Master Musicians of Joujouka, Leagas layers pipes and wails over hand drums before it sinks into silence and slowly re-emerges with wailing pipes and drums, bolstered by hollow synth shudders and edgy electronics capturing the wild spirit of Enkidu, as captured in the writings of this ancient text from the long lost ancient region of Mesopotamia. The drum rhythms so prevalent on Godlesstate are absent from both 'Ice Voyage' and 'Doggerland' as we cross lands and switch continents via sojourns to witness newly discovered bronze age ships unearthed on UK shores and contemplate lands lost beneath the waves. Immersed in the sound of crashing waves and the brittle chime of a zither, the voice of Roger Ekstam rises on 'Ice Voyage' with a short spoken word section about our forebears heroic sea journeys delivered in his native Swedish tongue, while hand bells ring and synths provide an undulating tranquil soundscape. As previously mentioned, Leagas is adept at sympathetic scores and that lightness of touch fills the lengthy 'Doggerland' with droning and evocative atmo-synths. Wordless and rhythmless 'Doggerland' is supremely solemn; it's evocative synth strings subject to passages of hazy discordant textures and ringing tones. The final section plays out like a lament for a drowned world, a land now lying at the bottom of the North Sea. The final 3 tracks forego the intricacies of the previous tracks for a more direct approach; almost appearing as an addendum to the earlier tracks. Accompanied by hand cymbals and percussion the elasticated twang of the jaw harp creates a celebratory mood for Gaya and Patrick to wish each other a 'Happy New Year Deer'. 'Zika At The Sill', meanwhile, imparts a pounding rhythmic beat, reminiscent of some of Mother Destruction's more danceable moments, cast against a layering of treated pipes, cascading hand drums and soft ooohing accompaniment to the repeated refrain of "Zika". Simple and infectious, its primal surge is nowhere near as intricate and involving as 'Catalhayak & Beyond' where piping shanai wails and intricate hand drum patterns conjure visions of centuries old Arabia. A miserly 3 minute running time is not enough to do this one justice; it is a wonderfully vivid soundscape that really warrants further extrapolation by Leagas.